The equalizer presented in this article is suitable for use with hi-fi installations, public-address systems. mixers and electronic musical instruments. The relay contacts at the inputs and outputs, in conjunction with S2, enable the desired channel to be selected. The input may be linked directly to the output, if wanted. The input impedance and amplification of the equalizer are set with S1 and S3. The audio frequency spectrum of 31 Hz to 16 kHz is divided into ten bands. Ten bands require ten filters, of which nine are passive and one active. The passive filters are identical in design and differ only in the value of the relevant inductors and capacitors. The requisite characteristics of the filters are achieved by series and parallel networks. The filter for the lowest frequency band is an active one to avoid a very large value of inductance. 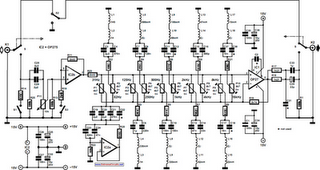 It is based in a traditional manner on op amp A1. The inductors used in the passive filters are readily available small chokes. The filter based on L1 and L2 operates at about the lowest frequency (62 Hz) that can be achieved with standard, passive components. The Q(uality) factor of the filters can, in principle, be raised slightly by increasing the value of R19 and R23, as well as that of P1–P10, but that would be at the expense of the noise level of op amp IC1. With component values as specified, the control range is about ±11 dB, which in most case will be fine. A much larger range is not attainable without major redesign. The input level can be adjusted with P1, which may be necessary for adjusting the balance between the channels or when a loudness control is used in the output amplifiers. 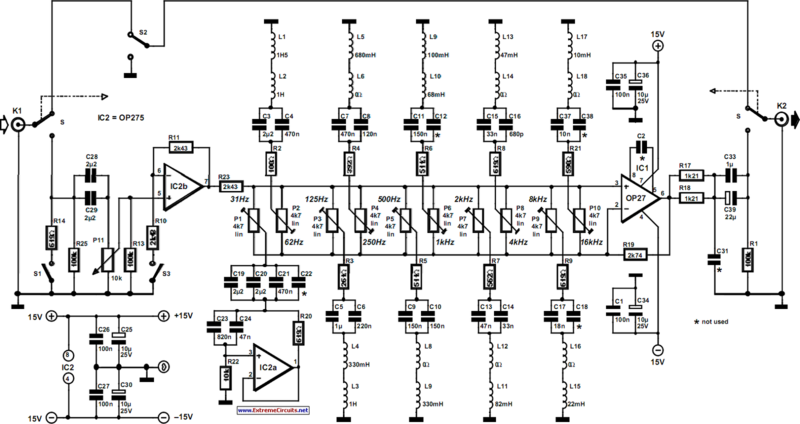 Several types of op amp can be used:in the prototype, IC1 is an LT1007, and IC2, an OP275. Other suitable types for IC1 are OP27 or NE5534; and for IC2, AD712, LM833 and NE5532. If an NE5534 is used for IC1, C2 is needed; in all other cases, not. The circuit needs to be powered by a regulated, symmetrical 15 V supply. It draws a current of not more than about 10mA.